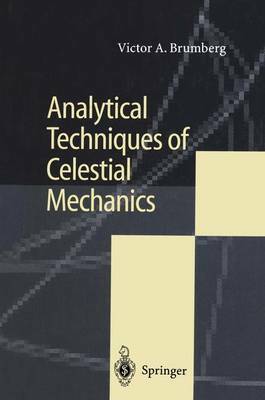 The aim of this book is to describe contemporary analytical and semi- analytical techniques for solving typical celestial-mechanics problems. The word "techniques" is used here as a term intermediate between "methods" and "recipes". One often conceives some method of solution of a problem as a general mathematical tool, while not taking much care with its computa- tional realization. On the other hand, the word "recipes" may nowadays be understood in the sense of the well-known book Numerical Recipes (Press et al. , 1992), where it means both algorithms and their specific program realiza- tion in Fortran, C or Pascal. Analytical recipes imply the use of some general or specialized computer algebra system (CAS). The number of different CAS currently employed in celestial mechanics is too large to specify just a few of the most preferable systems. Besides, it seems reasonable not to mix the essence of any algorithm with its particular program implementation. For these reasons, the analytical techniques of this book are to be regarded as algorithms to be implemented in different ways depending on the hardware and software available. The book was preceded by Analytical Algorithms of Celestial Mechanics by the same author, published in Russian in 1980. In spite of there being much common between these books, the present one is in fact a new mono- graph.